This post covers the readings from The Acts of the Apostles for Easter Week, Acts 1:1 – 4:22. For a list of all the readings through the Easter season, click here. The Acts of the Apostles, also called Acts, is companion book to the Gospel of Luke. While tradition holds Luke the Physician authored both, neither the Gospel of Luke nor the Acts of the Apostles names the writers. We can, however, tell from the style of the written Greek that both volumes were written by the same author. Acts, like all the books of the New Testament, was written in Koine (Common) Greek, which means every English version we read is a translation. 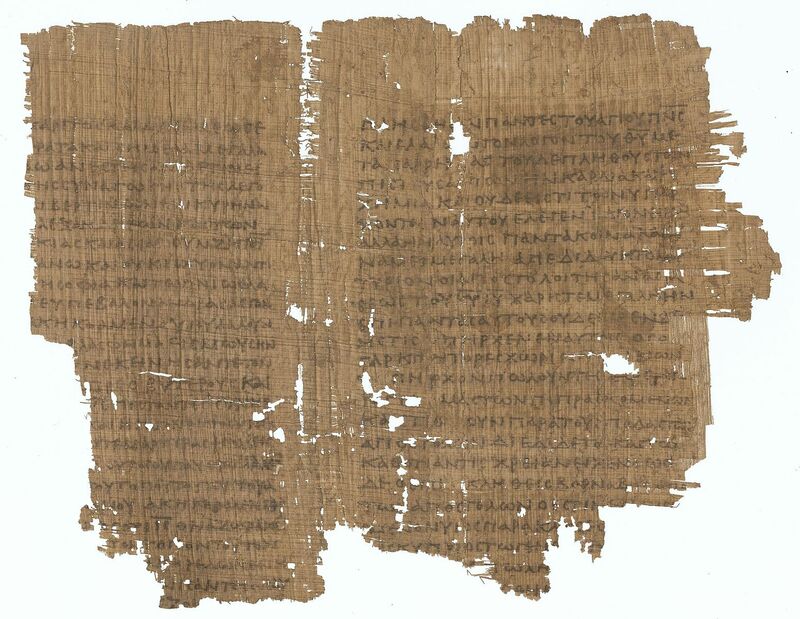 Papyrus 8 – Papyri of the Acts of the Apostles (4th century) Staatliche Museen zu Berlin. Wikicommons public domain. Like Luke, Acts opens with a reference to Theophilus, who may have been an individual person. Theophilus translates into lover of God, so some scholars note that both volumes are actually addressed to any person who is a lover of God and, by extension, a follower of Christ. 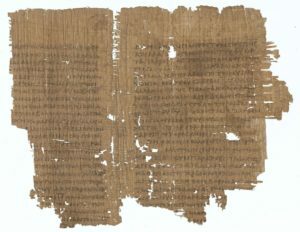 Acts was circulating among early Christian communities by the early 2nd century, and most scholars put the date of its authorship between 80-90 CE, although dating written documents in the New Testament is more art than science. What was going on in Jerusalem as Luke and Acts were written? The Temple had been destroyed, a final blow by the Romans to end the Siege of Jerusalem, the Pharisees had become the dominant form of Judaism, and both Jews and Christians were persecuted by the Roman Empire. This was a time of political/religious unrest. For an expansive view on the history of Jerusalem from its ancient founding to the modern era, Jerusalem: The Biography by Simon Montefiore is a worth-while read. The history of Acts reminds us that Acts, like all books of the Bible, were birthed out of times and places, and knowing the history of time and place invites us not to collapse the almost 2000 years from the place of the writing of Acts into our modern era. Acts was not written in a time of religious freedom, nor was it written in a culture of separation of the religious and political. War and violence were commonplace, and the Christian community was varied and diverse. The population of towns and cities was significantly smaller. People of places like Nazareth really did know everybody. There was no Book of Common Prayer, New Testament (the collection of books and letters we call the New Testament didn’t become official until the 4th century), or established common practice of Christian communities across the Roman Empire. As we read Acts, we are all invited to reflect on what this story tells us about the very early community of followers of Jesus in their time and culture and how it informs and guides our modern faith. Acts opens with Christ’s Ascension. The Resurrected Jesus has been with his disciples and friends. He tells them they will receive the Holy Spirit and gives them their instructions – You will be my witnesses in Jerusalem, and all Judea and Samaria, and to the ends of the earth (Acts 1:8). Jesus ascends, and the account has allusions to the Transfiguration account in Luke. The writings of Luke and Acts refer back to themselves frequently, so as you read Acts, you may begin to notice patterns and references back of previous events. The disciples, together with certain women, devote themselves to prayer, choose an apostle to replace Judas so there are 12, and receive the Holy Spirit. Acts 2 is the textual basis for our Feast of Pentecost. Reading it closely, even outloud, is a worthwhile endeavor. Notice a few things as you read. First, who are the “all” in verse one? Many images show only the 12 apostles, but others argue it refers to the 120 Peter addresses earlier in Acts. What difference does that make, if any? A direct consequence of receiving the Holy Spirit is Peter’s address to the crowd, the beginning of the Christian witness that Jesus directed at his Ascension. Peter is not filled with wine, but the Holy Spirit. For comparison, read Luke 4:1. Jesus is filled with the Holy Spirit, and a consequence of that at his baptism is being led into the wilderness. Perhaps the disciples are being led into a different wilderness with its own temptations (see, that reference back again…). And those who hear Peter’s Spirit-inspired speech? How do they respond? We read, “Peter said to them, ‘Repent, and be baptized every one of you in the name of Jesus Christ so that your sins may be forgiven; and you will receive the gift of the Holy Spirit’.” Here, in Acts, we modern Christians see the early church’s fundamental responses to an affirmation of belief that Jesus is Lord and Messiah: repenting of one’s sins, being forgiven for those sins, being baptized in the name of Jesus, and receiving the Holy Spirit. We then read about qualities of the first Christian communities, that they devoted themselves to the apostles’ teaching and fellowship, to the breaking of bread, and to prayer. As we begin our celebration of the Great Fifty Days of Easter, we as followers of Jesus are now called to respond to the Good News that Christ is alive. He has conquered death, and we who have died with him also rise with him into Eternal Life. A core way we experience this belief is through our baptism. Many of us may have participated in baptisms at the Great Vigil of Easter. We who are baptized, like the first followers, are changed because of our baptism. We, like the first followers, are charged to be Jesus’ witnesses to the ends of the earth. This week, read and re-read this portion of Acts, reflecting on the following, either as personal time of devotion or as part of a prayer group or Bible study group. Journal your answers, comment on them in the comment section of this post, or share and discuss them with your study group. What do you know about Jerusalem and the surrounding area in the time of Jesus and the century that followed? How might those historical and cultural differences change or nuance your understanding of the Gospels and the book of Acts? Note: there are many quality resources about the Ancient Near East on the internet. The Frontline documentary and its supporting sources for From Jesus to Christ (available here) is an excellent source for in-depth study. How do you interpret Jesus’ directive as he ascends? What is the “power” of the Holy Spirit and what does Jesus mean by being his witnesses? How do you explain the Holy Spirit and how have you experienced the presence of the Holy Spirit in your life and in your faith community? Read the account in Acts 2:37-47 again, telling of the first converts and the qualities of their faith community. Now read the Service of Baptism in the Book of Common Prayer (page 299 and following). Where do you see similarities? Where do you see differences? Considering the qualities of the first community of faith in Acts, how are these qualities present in your own church? How are they present in your communities, your family, work, or social organizations, for example? Thank you so much for this encouragement to read Acts during Easter. I thought I was subscribed but have only received this ONE reading- aren’t supposed to get one on each of the 50 Fays of Easter? We’re part of the Good Book Club this year (and trying something new), so instead of daily posts, we’ll have a post Monday reflecting on the upcoming week of readings from the book of Acts and have a post or two later in the week with videos, art, or other reflection that individuals and groups can use as they read Acts.